The Concertino and Rhapsody were composed against the backdrop of an ‘anti-formalist’ campaign, spearheaded by Andrei Zhdanov, who had been appointed in 1946 to direct the Soviet Union's cultural policy. Under this oppressive regime, composers were compelled to compose in a style accessible to the people. However, this wasn’t Weinberg’s only problem. He happened to be the son-in-law of the prominent Jewish actor Solomon Mikhoels, who was murdered in 1948 as a result of the ideology of ‘anti-cosmopolitanism’, an attempt to suffocate Jewish influence on society. In February 1953, Weinberg was tailed and arrested and underwent an eleven week interrogation process, only brought to an end by the death of Stalin in March 1953. During these oppressive years, he continued to compose prolifically, adapting to the cultural pressures, and moderating his style in the process. So, lyricism and folk elements imbue the scores. The first two works on this present release are products of this time. The Concertino op. 42 for Violin and String Orchestra was composed in 1948, and is an immediately appealing work. The violinist Ewelina Nowicka is ideally positioned in the sound-picture to give a refreshing, warm and persuasive account of this delightful score. The work has an innate simplicity and structure, and is the sort of music you can just sit back and enjoy. The first movement is invested with a wealth of melody, and is separated from the heartfelt Adagio by a cadenza. Nowicka’s imaginatively phrased playing in the impassioned slow movement adds an element of profundity to the music. The Rondo finale has a waltz-type theme, but underlying echoes of wistfulness pervade. Dating from the same period as the Concertino, the Rhapsody op. 47/3 on Moldavian Themes exists as both a purely orchestral version and as an arrangement for violin and piano, published with fingerings by David Oistrakh, who did much to champion it. A version for violin and orchestra was purported to exist by the composer, who maintained that it had been performed on the night of his arrest. As it no longer exists in this form, this present arrangement has been made by the violinist Ewelina Nowicka. The work inhabits a Jewish sound world, and recalls to mind George Enescu’s Romanian Rhapsody No. 1. Weinberg’s masterly use of Moldavian folk rhythms and themes makes this a compelling listen. The Amadeus Chamber Orchestra of Polish Radio put plenty of personality and lusty exuberance into this dazzling performance. The Symphony No. 10 op. 98 for String Orchestra dates from 1968, and was dedicated to Rudolf Barshai and the Moscow Chamber Orchestra; they premiered it the same year. Written for strings, it is cast in five movements, the last four being linked. It provides a stark contrast to the more spirited and lyrical complexions of the previous two works. The opening movement is marked Concerto grosso-Grave and mirrors the neo-Baroque in tone. Weinberg paints a bleak and desolate landscape. In the central section the pace quickens, with the narrative becoming spiky, angular and persistent. The solo cello makes an anguished plea towards the end. A Pastorale follows, and once again an austere, gloomy scene is evoked by the employment of lightly-textured scoring. There is an underlying sense of tranquility throughout. The violin interjects with a solo cadenza. We are then transported into a furtive and suspicious Canzona, whose stealthy manner is highlighted by the use of pizzicato and glissandi. Once again the solo violin makes an appearance. The Burlesque is gruff and angry, with Weinberg incorporating some dissonant harmonies to make his point. The fifth movement is marked Inversion-L’istesso tempo, and begins busy and unsettling, with swirling strings; it is relentless in character. The initial tempo and mood of the opening movement returns to close the symphony. The violin solo contributions by Ewelina Nowicka are vividly captured and beautifully rendered. I did a listening comparison of the Tenth Symphony to a version I have with its dedicatees the Moscow Chamber Orchestra, conducted by Rudolf Barshai on Olympia (OCD 471), Vol. 1, recorded in mono in 1970. The sound of this older recording is rough-edged, and the tempi are much quicker (31:17 for Barshai, 37:30 for CPO). I prefer the more spacious account of this latest traversal, coupled with CPO’s sumptuous sound. I see that earlier this year Melodiya released this early recording, coupled with the Sixth Symphony under Kirill Kondrashin (MELCD 1002281). Another version by Gidon Kremer & Co. (ECM 2368/69), which also includes the Op. 42 Concertino, has received favourable reviews by two of my colleagues (review review) but, unfortunately, I haven’t heard it. 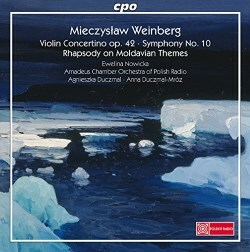 This latest release in CPO’s Weinberg series, makes a further compelling case for this Soviet composer, who is undergoing a justifiable major rehabilitation by the record companies, after a long period in the wilderness. Last year I reviewed a CD of his chamber music (CPO 777 804-2). Comprehensive liner-notes have been contributed by David Fanning, with German translation.